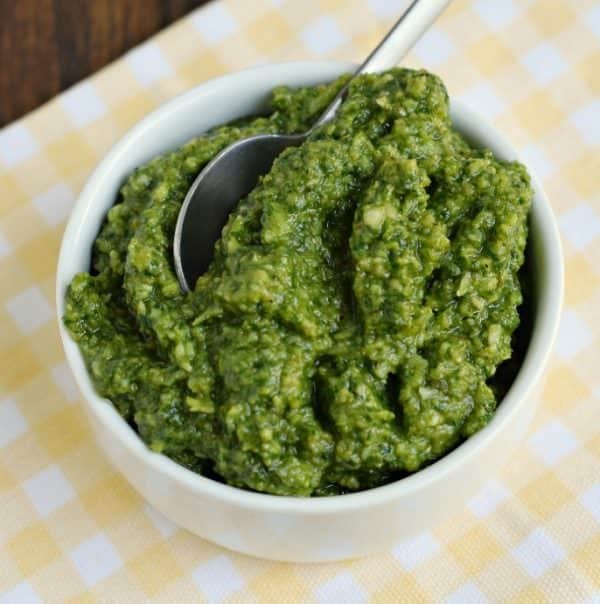 This quick and easy Basil Pesto is so delicious, you’ll need to make a second batch! Perfect for adding to pasta, fish, baked tomatoes and sandwiches, it’s kicks up the flavor of your favorite foods! My garden is going insane this year!! 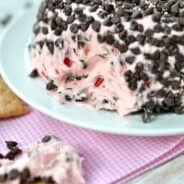 I hope you guys are ready for an influx of zucchini recipes! I’ve already got some made and photographed, and they’ll be up on the blog here soon! But today, let’s talk about basil. 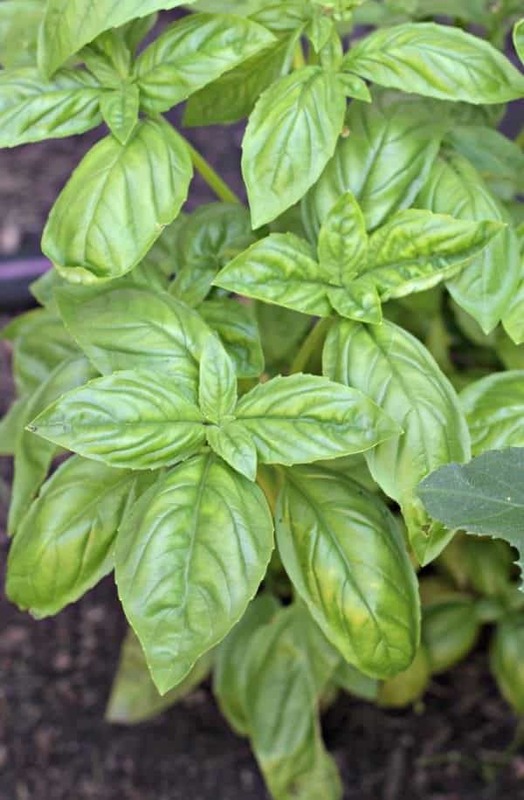 Some years my basil plants are small and wispy…and some years they grow into a bush! This year…I’ve got basil bushes growing in my garden, haha! 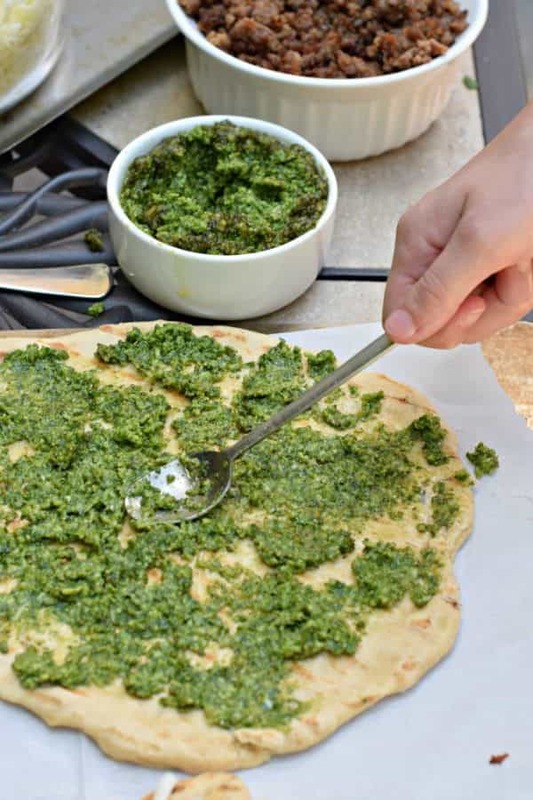 And while we use a lot of it to make our favorite bruschetta recipe…I’m also going to share our go-to BASIL PESTO recipe today! Some of you may be thinking, hmmmm, I love pesto, but what can I use it on? Pasta: Mix the pesto into some warm pasta noodles. Side dish completed, it’s that easy. Add some chicken to make it a meal. Halibut: adding a thick layer of pesto, breadcrumbs and parmesan cheese makes a tasty dish! Salmon: Top your salmon with pesto and almonds. 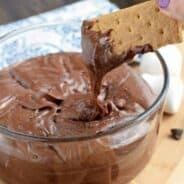 OMG yum! Shrimp: on the grill and delicious! Baked Tomatoes: healthy idea that uses up some of my summer tomatoes too! Pizza: make a grilled pizza with pesto, tomatoes and cheese! I even made you a quick video to show just how easy it is to make Basil Pesto! 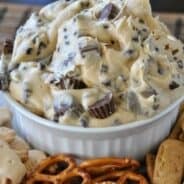 If you have too much, put it in ice cube trays in the freezer. Then when making spaghetti, toss a few cubes into your sauce for extra flavor! ENJOY! 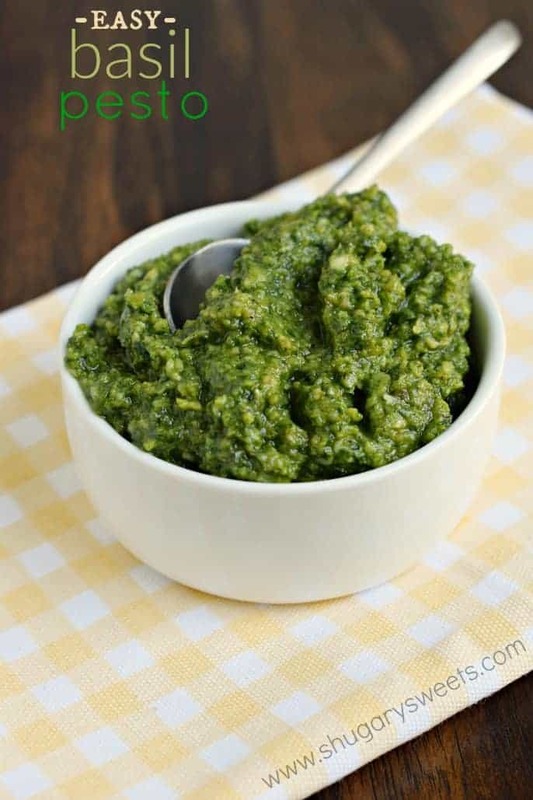 This quick and easy Basil Pesto is so delicious, you'll need to make a second batch! Perfect for adding to pasta, fish, baked tomatoes and sandwiches, it's kicks up the flavor of your favorite foods! 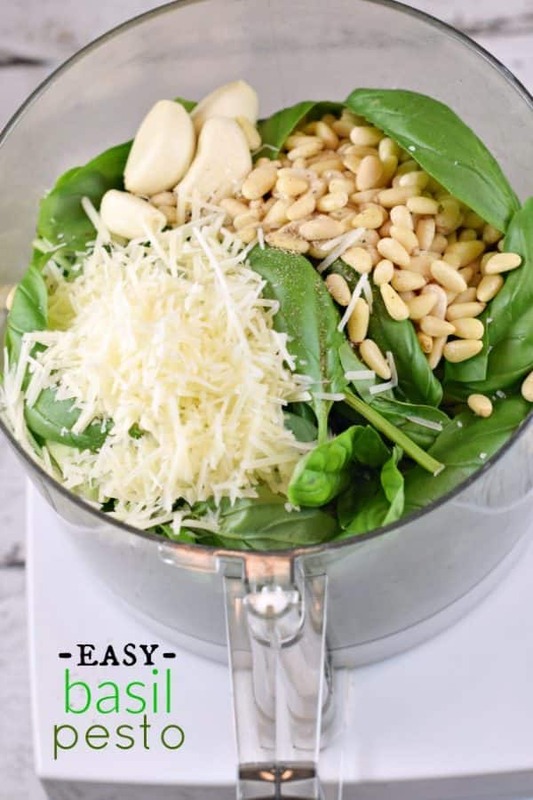 In a food processor, combine basil, pine nuts, garlic, salt, pepper, and parmesan cheese. Blend until fine. Slowly add in the olive oil and blend until desired consistency, adding more or less oil as needed. Store in airtight container in refrigerator for up to 3 days. ENJOY. 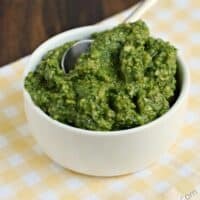 Thanks for simple and great recipe for pesto. It was the first time I made pesto and your video made it super easy.